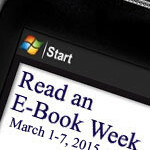 March 1 kicked off Read an E-book Week. The Week was officially recognized by Chase Calendar of Events in 2004. Of course, the purpose is make readers aware of the potential of e-reading. I was one of the purest. I just couldn’t imagine reading electrons rather than pages. I was sure I wouldn’t enjoy holding a little device, while curled up in a favorite chair, and getting lost in a plot. A few years later, and not only do I read many of my books and magazines with my iPad, I publish e-books, and format them for others. Although I don’t take the electronic device into the bathtub for a long soak and good mystery. I’m not a complete convert, I still have a healthy supply of print books. I enjoy the smell of an used book store and the feel of the printed page. I have found, though, that I appreciate the convenience of having something to read readily available. I have Kindle app on my phone, so I can read in long lines or waiting at the doctor’s office. It’s also easier to travel with my iPad full of books rather than a book-laden suitcase. If you haven’t taken the plunge, now is a good time to give it try. It’s possible try an e-book without purchasing a new device. Amazon and Barnes and Nobles both have e-book reading apps for all types of devices. I primarily use my iPad, but have the apps on my phone and my laptop as well. A real plus to these e-books apps is they sync. So no matter what device I open my book on, it will open to the page I stopped reading at. You also don’t need to buy e-books to give it a try. Amazon has 400 pages of free Kindle books. (These list change daily. What may be available today, may not be tomorrow.) Barnes and Nobles has similar lists. 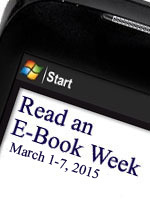 Read an E-book Week happens to correspond with Read Across America in honor of Dr. Seuss’ birthday, March 2. While I believe that device time for little ones needs to be limited, all types of e-books are available for children as well. If you haven’t already, take the plunge this week and try e-reading. In honor of Read an E-book Week, I’m offering my book, Science in the Kitchen: Fearless Science at Home for All Ages (PDF), from all this week. Just click here to start the download: Science_in_the_Kitchen. This offer is no longer available. You may purchase Science in the Kitchen: Fearless Science at Home for All Ages (print or PDF) here. Have you taken the e-book plunge? What do you like about your e-reader?